Mrs. 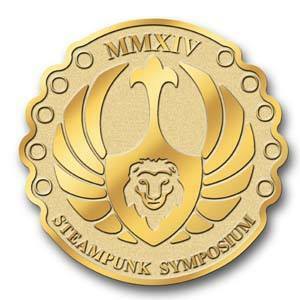 Uncommon Geek and I have been to every Steampunk Empire Symposium since it started in 2011. The first year, I was known as “Tee Shirt Guy” because I was the only one who wasn’t decked out in my finest Neo-Victorian dress. I was suffering from my back injury flaring up and was hopped up on strong steroids and opiate pain killers that did absolutely nothing for me. The second and third years, I volunteered to work security, and people think I did a good job at keeping them safe! But, the primary reason why I went to the Symposium this year was to do a planel on the Jedi vs The Borg! And Blog Monkey Neo was right there with me! Mrs. Uncommon Geek and I arrive to the hotel and get as settled in as we can. She was there to help her Sister-in-Law work the Sylvian Creations booth and as I said before, I was working security, but, My shift didn’t start for some time. After I checked in at Con-Ops, I ask the head of the panels if I could see the room I would be in and if I could start getting things set up about 2 hours before my panel was scheduled. And since I was the first panel of the con, it was no problem. I got everything set up, and Neo arrived about 45 minutes before the panel’s start time. We decided to go mingle with people for the sole purpose of telling everyone we could about our panel. And because I’m actually a very shy person, less people got told than what I thought. But, several people said that they were actually planning on seeing our panel! Even people in the registration line! And for a moment, I felt just a little important! More people showed up for the panel than what I thought would. Honestly, I thought I would only have maybe 4 people at most. But, we had about 20! After the panel, which was well received, and was told that I did very well for my very first convention panel, Neo and I walked around the Symposium for a bit before I went on security duty. I introduced him to some of my friends, we ate some nibbles along the tea stroll, then after I went on duty, he left for the evening. On Saturday, I participated in the Tea Dueling. Basically, competitive cookie dunking in tea. The last to eat the cookie wins the round. It may sound odd and easy, but it is actually a bit stressful! You are staring at your cookie, winching at every slight wobble of your hand and you don;t know if your opponent is staring at you trying to psych you out or not. I was scheduled to work in the vendor hall for 3 hours on Saturday as well. It wasn’t all that bad since I could talk to the vendors and learn more about the wares they were selling. I was able to speak with a nice lady from Goblin Road Dolls & Masks who’s name I believe is Rachael. I bought some chocolates from War Pony Candies, and talked a bit with a nice lady who was selling small plastic guns that she had made with a 3D printer! It was the coolest thing! Sadly, I can not recall her businesses name. I also stopped by to speak with Mrs. Uncommon Geek from time to time. Once my round in the vendor hall was done, my brother-in-law and sister-in-law, Mrs. Uncommon geek and I went out to Japanese for dinner at a place called Ando, which was a short walk from the hotel. The food was amazing and the prices were pretty good as well! Since I had to be on duty in 2 hours and the restaurant was packed, I scarfed down my food and made it back in time for my next shift. Honestly, I wish I would have had more time to actually enjoy my food as well as the good company. I also wanted to try the green tea ice cream, but duty called. Sunday, all I was scheduled to do was to help tear down convention items. I was tired, hungry, my feet were swollen and hurt, and all I wanted to do was take my shoes off and lay down in a bed that was mine. After a few hours of helping clear the stage where the song performers were, the Mrs. and I headed home. It was good to be going home, but, we missed all of our out-of-town friends that we really don;t get to see on a semi-regular bases. I know this turned out to be a short review, but working a con and going to a con are two totally different experiences. Each side of the ticket can be both overwhelming and gratifying at the same time. Doing the panel helped me realize that I want to focus more on being a presence at cons for my site rather than working on staff of the convention. I enjoyed geeking out with people more so than making sure that people had the right color wrist band. Don’t get me wrong, I enjoyed being security as much as I could, but, in the end, I discovered that you can either work a con, or you can enjoy a con, but not both. So, in the future, I will have a table in the exhibitor’s area to promote the site and to ask people our traditional, standard question… Do you like and or prefer, Star Trek, Star Wars, both, and why?